This is an area where Advanced Electrical Contractors really excels. We work very closely with some of the UK’s leading suppliers and have an excellent working relationship with our design team who not only provide the initial design, but provide on-going support throughout the project. With a wide range of systems, there is something for every budget to make your life easier, more convenient and more comfortable. We listen to our client’s requirements carefully, before proposing a range of options that reflect their needs and budget. There is a home automation system for every lifestyle! We can install a total system, or we can design and install a system in a series of ‘building blocks’ which can be added to in steps, depending upon your budget or desire. Smart Home Technology and Home Automation Systems is the world of intelligent control within your home. From the comfort of your armchair, at your desk or anywhere in the world, you can control your home at the touch of a button. By controlling temperature and lighting based on time of day or occupancy, home automation products can reduce energy costs. Home automation systems offer convenient control of energy management with touch screens, the internet, web-enabled phones or the home telephone. Be comfortable at home and save energy when away. Control temperatures in greenhouses, humidors, wine cellars, aquariums and attics. Home automation will keep a watchful eye around your home, even when you’re away. Network Digital Video Recorders will record video based upon time, event or motion and you can play back video and view full screen surveillance at your convenience. Cameras can be viewed on touch screens, over the internet or on your web-enabled phone. When the doorbell rings or motion is detected outside, the video feed can automatically appear. Want to invite your guest in? Simply press and hold the camera selection button to open the door or gate. Lighting control enhances the enjoyment and value of your home and contributes to savings on your energy bill. Control your home’s lighting by schedule, motion detection, door openings, sunrise, sunset, alarm activation and more. Just touch one button to turn every light in a room or whole house on or off. Custom laser engraved light switch keypads are also available to personalise scenes in rooms for a romantic evening or a social gathering. Match lighting to your mood and set warm and comfortable moods for dining, movies or entertaining. Have lights automatically turn off when leaving your home. Provide architectural quality lighting control and passive security for the “lived-in” look when on holiday. Hosting a special dining event? Easily set lighting to emphasise points of interest such as artwork or furnishings. Limit the mingling areas by lighting only the rooms or sections meant for gathering and when your guests have bid farewell, press one button to close your evening. Home automation lighting control can even be retrofitted into existing homes without the addition of new wiring. Home automation’s high security, digitally encrypted proximity card reader connects to any home automation system to manage gate and door access. Use either a standard credit card sized access control card or the convenient access control key tag to access the system. Home automation offers an access control keypad that is weatherproof and vandal resistant. Each card or key tag is tied to a specific user and all actions can also be customised for each individual user. Access to the wine cellar, out buildings or pool areas can all be restricted to specific individuals. Swipe the card to activate pathway lighting and additional safety features. Swiping a card can disarm the alarm, release the door lock, light a pathway into the house, change the temperature and turn on several zones of a whole home audio system. Without compromise, you can now achieve total control of all A/V systems through one interface. Additional automated features can be integrated to complete environmental control. Use one button on a touch screen to close the curtains/shades, lower a screen and turn on the appropriate A/V equipment. 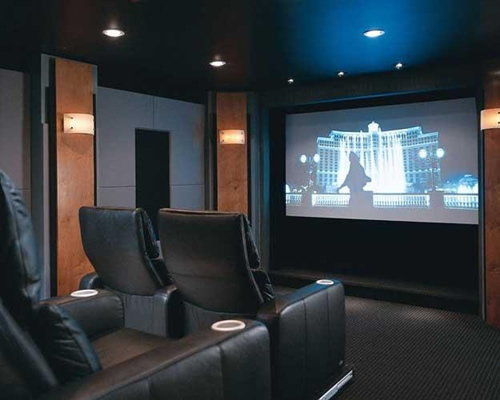 Even automatically adjust the lights and set the room temperature for the perfect theatre experience. Set the mood, room by room and share your music throughout your home. A home automation audio system can be controlled wirelessly via remote control, wireless touch screen or mobile phone for convenience. Home automation’s unique remote input modules let you easily plug into sources you already own. It’s simple and easy to update to the newest music source. No audio rack or expensive proprietary components required. While mum listens to relaxing jazz on satellite radio in the kitchen, dad can enjoy the game outside as he barbecues. In the meantime, the kids are rocking out upstairs. The above systems can be extended and installed in any size location, ranging from your home to larger locations such as churches, hotels or larger entertainment complexes. We welcome your call for an initial, informal discussion to explore the systems you require for your project. Please contact us now to discuss any of the above examples or perhaps more technical systems that you have in mind for your home or business. For a free, no obligation quotation, click here to send us an email, or call us today on either of the phone numbers below.